There is a huge difference between a bowl full of noodles and a noodle bowl. A bowl full of noodles could be a packet of Ramen or even spaghetti, but a noodle bowl is a completely different beast. When noodle bowls won the poll last week, I was excited and scared. It’s one of those things that seems so simple, but is really hard to make well. I think my final Mushroom Tofu Noodle Bowls were really solid. It was not the best noodle bowl I’ve had in my life, but I would be happy to eat it regularly. The flavors were deep and spicy and I really enjoyed it even on a hot summer day. 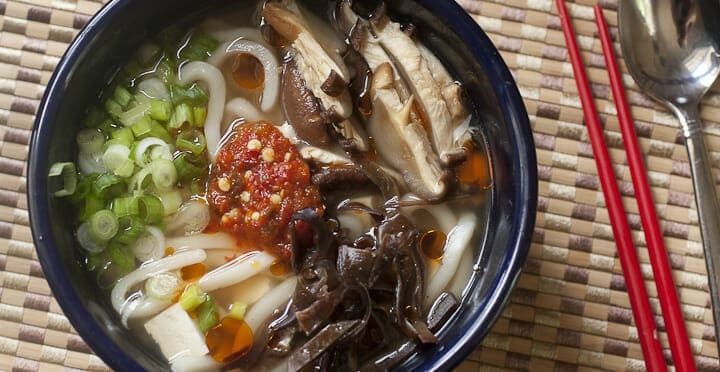 Noodles cooked in a rich and spicy beef broth and topped with tofu, mushrooms, and scallions. Guaranteed to please! 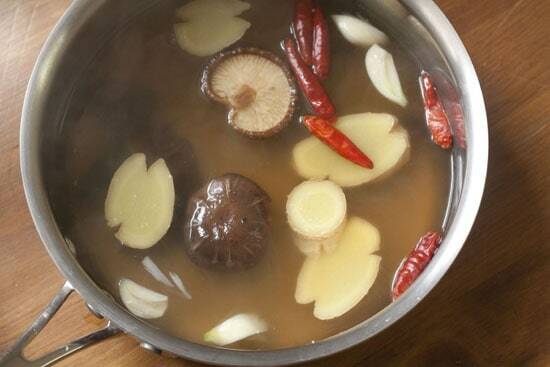 1) Add dried mushrooms, crushed garlic cloves, sliced ginger, and dried chilis to the broth in a medium pot and bring to a simmer. Let simmer for at least 10 minutes to infuse flavors. 2) Discard all the add-ins except the mushrooms and fungus. Slice that stuff thinly. 3) Add noodles to broth along with cubed tofu. Let simmer for 5 minutes until noodles are cooked. Season with salt or soy sauce and a dash of rice wine vinegar. 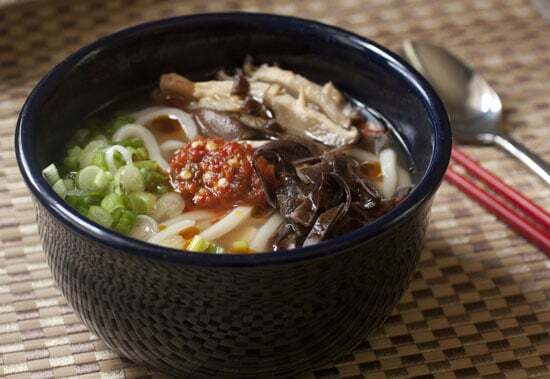 4) Ladle noodles and broth into bowls and top with mushrooms, scallions, chili oil, and chili garlic sauce. If you’ve ever seen a real noodle shop in action (sound), you’ll know why I decided to take a shortcut and not make homemade noodles for these Mushroom Tofu Noodle Bowls. That’s not to say that I don’t want to do it at some point in the future, but for my first noodle bowl, I decided to focus on the stock rather than the noodles since my favorite part is the broth. I posted the homemade beef stock that I used for my noodle bowls yesterday, but to beef up (punny) the flavor a bit, I tossed in some other ingredients as the broth simmered. 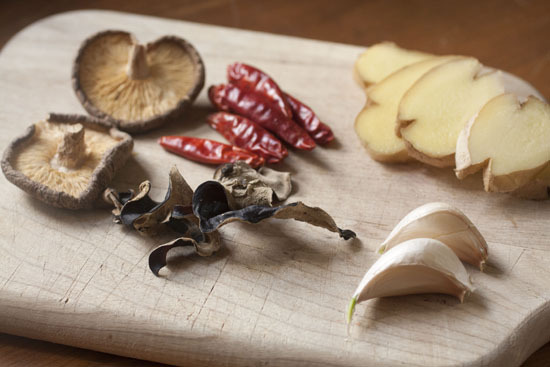 If you don’t know what those shriveled black things are at the bottom of my cutting board, they are a common Chinese ingredient plainly called black fungus. You can find them dried in most Asian markets, but if you can’t find them you can just leave them out also. 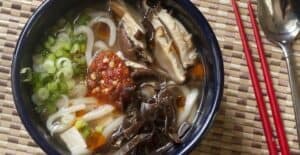 The dried mushrooms give the broth some added richness and the other flavors just make it more delicious and complicated. The chili peppers are especially important as they give the broth a bit of heat. Just toss all these things into your broth in a medium pot and simmer it for about 10 minutes to infuse all the flavors. After simmering for 10-15 minutes, you can scoop out all of the ingredients. Just discard the peppers, garlic cloves, and ginger. All of their flavors are sucked into the broth now. 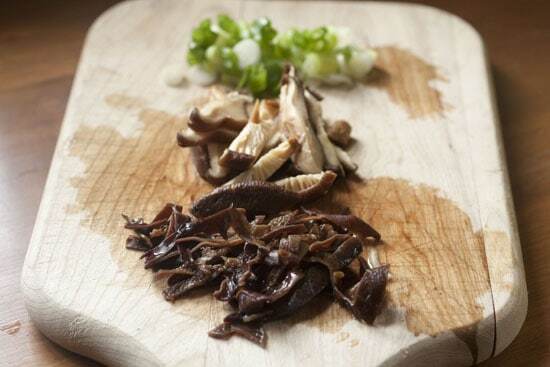 As for the mushrooms and black fungus, just slice them all into pieces and you can use those to top the noodle bowl. Watching an expert hand stretch noodles is magical. It also looks extremely difficult. I wanted my first noodle bowl to be a success so I decided to hold off on the homemade noodles. 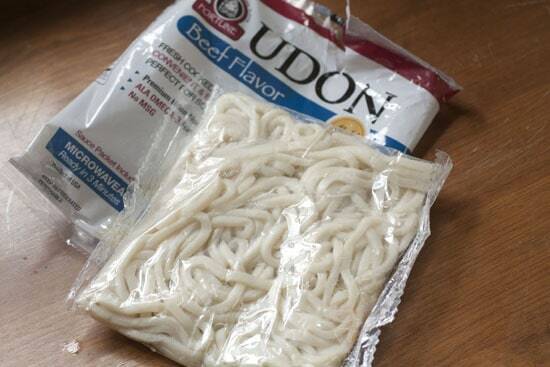 For my Mushroom Tofu Noodle Bowls, I found some fresh udon noodles that I used. I just discarded the flavor packet since we already have lots of flavors going on. If you can’t find fresh noodles like this, feel free to use the dried kind. These are just nice and thick and chewy and remind me of hand-stretched noodles that I’ve had, although not quite as good. 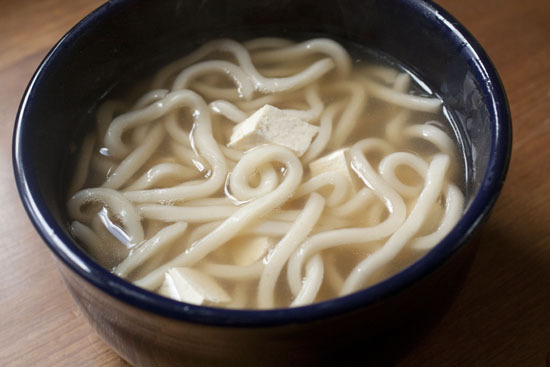 Once you have simmered your broth with the add-ins, there’s not much left to do to prepare the noodle bowl. Just toss your noodles into the broth and also add in some cubed tofu if that’s your thing. Traditionally, a beef noodle broth like this would be served with slivers of beef, but I like it a bit lighter with the tofu. I also like to add about a tablespoon of rice wine vinegar to my broth as it cooks the noodles. It gives the final broth a nice tanginess. Once the noodles are cooked, you can just ladle some of the noodles and tofu into a large bowl along with a good amount of the broth. You might want to also taste the broth for salt. I didn’t use any salt to make my homemade stock so it needed a pinch of salt to wake up. 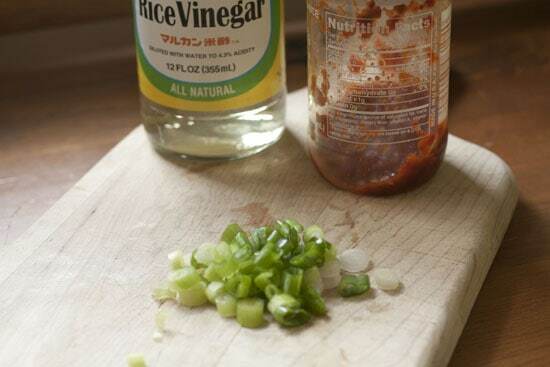 You could also add a dash of soy sauce. Then you just pile on the toppings! I went with the mushrooms and black fungus, scallions, a drizzle of chili oil, and some chili garlic sauce. It was a really fantastic meal. This is a bit different than a traditional noodle bowl, no doubt, but guess what: I’ve never been to Asia and have only had a handful of authentic noodle bowls in my life. I’m sure there are people that can and will point out multiple errors in my preparation, but all I know is this was a really good bowl of food and I would happily eat it again. Jesus! That is a really good looking noodle bowl! Suddenly i am sooo hungry, cannot wait to try this at home. favorite combination: easy and tasty! Looking good..i’ll try this recipe in weekends. !! This looks delish and is making me look forward to getting home to my own kitchen! It’s pinned and I’ll definitely be trying as soon as possible. Those funny lookings black fungus thingys are also known as wood ear mushrooms, I think. I like them because of the slightly crunchy texture. I think they are also supposed to be good for you. Saimin is one of the dishes I miss the most since moving to the mainland. My name is Kelsey, I am a student of Hospitality and Tourism Management. I wanted to let you know I really think you have a great combination of stunning photography, excellent taste and presentation, and also are a really inspiring writer. I wanted to thank you for your work I am really enjoying; and let you know that I am really learning from you. Everything is very nice, I look forward to seeing where your creativity goes, and I really what I feel is healthy eating. Take care, Happy 30th. « Roasted Beef Stock Recipes Home » The Internet Kitchen: Scorched!